Boston may be known as the hub of good eats in the Bay State, but what about the rest of New England? Sweet and savory crepes, a solid corned beef Reuben or the quintessential lobster roll are just some the yummy finds that await you! Boston may be known as the hub of good eats in the Bay State, but what about the rest of New England? Sweet and savory crepes, a solid corned beef Reuben or the quintessential lobster roll are just some the yummy finds that await you! As summer (FINALLY) arrives, day trip season is definitely upon us -- whether you're a New England native or just visiting, be sure to include these foodie gems in your summer travel plans! 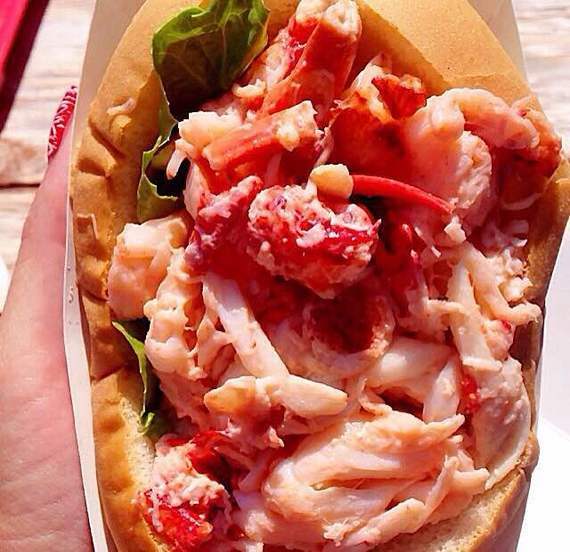 Nothing says New England quite like the lobster roll amiright? Whether you like it hot or cold, you can't go wrong with the rockstar roll at Roy Moore's. Nestled along the quaint street of Bearskin Neck in Rockport, MA, you can chow down on the back deck of this no frills spot, sipping on your beverage of choice (read: BYOB). If you still have room (you won't), stroll a little ways down Bear Skin Neck to Helmut's Strudel Shop for a piece of sweet cream strudel that will knock your (Red) socks off. Pancakes, rustic 1830s décor and a view of the Granite State's White Mountains...what more could you ask for? If you're in search of a unique breakfast experience then Polly's is just your place -- but be prepared for quite a wait! While you can order your traditional breakfast staples, let's be honest... you come to Polly's for the pancakes. Here's how it works: You get six three inch pancakes, choosing your own combo of batter (choices include cornmeal and oatmeal buttermilk) as well as add-ins like chocolate chips, blueberry and coconut (give it a try! ), all topped off with NH maple syrup. Your cakes come out in piping hot "flights" of 3, so your pancakes won't be cold! Oh, and don't leave Polly's without getting a mountain selfie. This flagship store in York, home to the endless varieties of jams, jellies and other specialty condiments, provides samples galore while you shop. Be sure not to fill up though- there are delicious eats to be had at the Stonewall Kitchen Café. 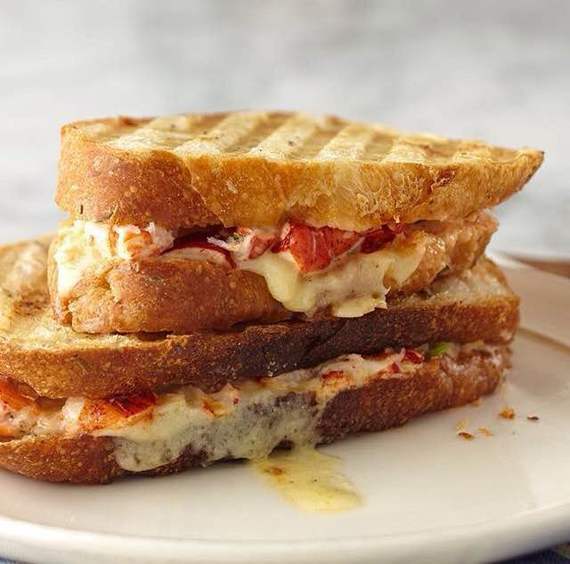 The Café menu is pretty extensive including sandwich options with Stonewall Kitchen condiments of course and lobster specialties like lobster mac and cheese, a lobster BLT and a lobster and brie Panini. For early risers, a breakfast menu is also available. Feel like brushing up on your cooking skills? Check the Stonewall Kitchen website and sign up in advance for Stonewall Kitchen's Cooking School-lessons range from whipping up Sunday brunch for a crowd, to homemade pasta to Spanish tapas to a perfectly seared steak. Got a hankering for a good pastrami sammy but don't feel like driving all the way to NYC to a Jewish deli-Rein's Deli has got your covered! Located in Vernon, right off of I-84, you really can't go wrong with anything here! 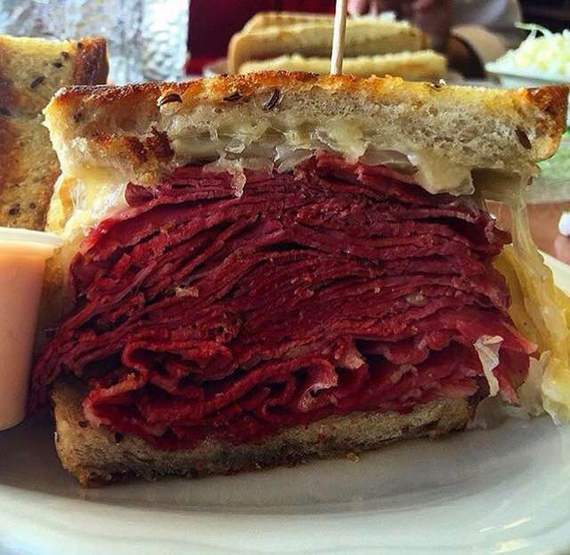 For a taste of the traditional go for the corned beef Reuben. Corned beef not your style? Make it a Rachel! Other classic fare like potato knish, cheese blintzes and stuffed cabbage are sure to please. Whatever you do- don't forget to ask for Rein's famous garlicky pickles! 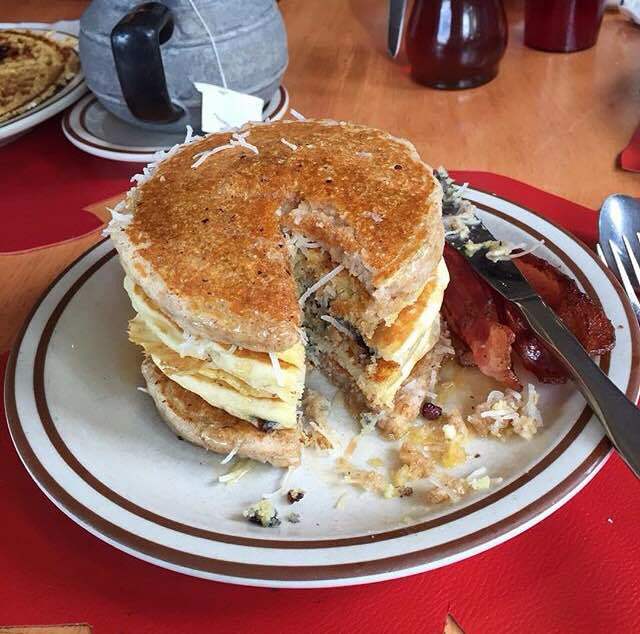 Tucked away in quaint Burlington, The Skinny Pancake prides itself on unique flavors and local ingredients. True to its (creative) name, the crepes are the true stars of this menu. 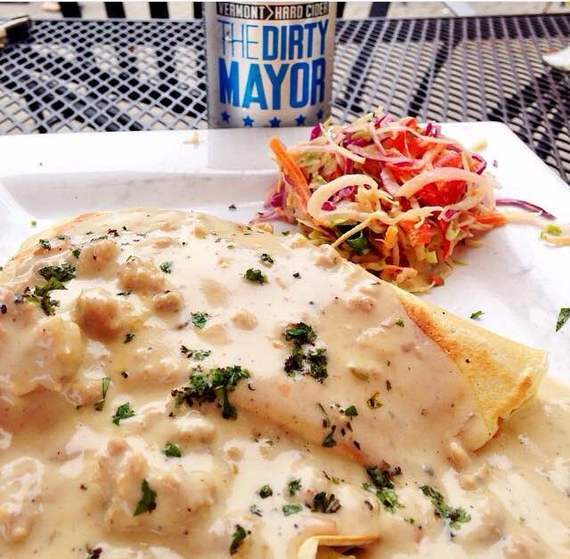 The "Josh Panda", a cornmeal crepe filled with fresh chicken tenders and shredded potatoes and covered in a rich sausage gravy or "Déjà vu", a crepe filled with VT sausage, Cabot cheddar and apples served with VT maple syrup make for perfect lunch options especially when you wash it down with a local hard cider. If it's your sweet tooth you're looking to satisfy though do not fear: crepes filled with fresh baked brownies and Nutella are sure you send you into a sugar coma. This spot is just steps away from Lake Champlain and Waterfront Park which is perfect for walking off the sweet treats! Seriously though who can resist sipping on a margarita in the middle of July in beautiful downtown Newport? (Answer: no one). 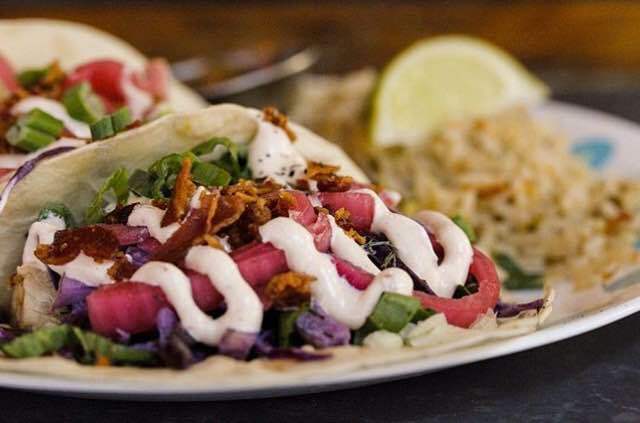 Diego's, located on Bowden's wharf, serves up some of the best Mexican in the state. The spot's creative drink menu and twist on your typical south of the border fare will have you making this a permanent stop every time you're in the area. Serving brunch and dinner, brunch is out of this world and includes a "$5 menu" with offerings like a breakfast torta and Mexican style eggs benny. For dessert, don't pass up the churros with spicy caramel sauce for dipping. For more New England foodie gems, be sure to follow NewEnglandNoms on Instagram.